Absolutely. For a show that had strong arcs and character development, on 4Kids of all places? It definitely deserves more love. Today the series is obscure when doesn't deserve the descent into obscurity, even with the worst of Fast Forward or whatever. Agreed. There were some bad episodes, but that applies to most shows anyway. I think so. I am finally sitting down and finishing the 2k3 series from where I left off about 3 years ago (partway through Season 4) and it's a great show. The 2k3 series has the unfortunate situation of being sandwiched between two other animated turtles shows, and its darker nature will probably alienate people who grew up on or previously saw the original show. Additionally, it had more of an identity crisis than the other two shows I think. The original show was more or less consistent in tone for a lot of its run, with the exception of the last 3 seasons which changed things up (though they only consisted of 24 of the 196 episodes of the series). The 2k3 series however changed quite dramatically with the Fast Forward season, which typically gets mistaken as a different series altogether. I am not looking forward to this season once I get to it, because I here it's not very good. Even Back to the Sewer could be confused as a different series as well. Then the 2012 series (which I have only seen the first few episodes of, but I want to change that) I have heard has more or less stayed consistent in tone. At the end of the day, I think a lot of TMNT fans and even the general public like the Turtles more lighthearted than not. After finishing the Utrom Shredder storyline the show seemed to fall into an existential crisis, not really knowing what to do with itself. I'd have preferred they introduced old show characters like Bebop, Rocksteady, Slash etc rather than going to the future and cyberspace. It's my favourite TMNT universe/medium. I'm surprised it doesn't get more live. To faithfully recreate so many original TMNT storylines, and create many new ones, mostly within multiple episode story arcs, was so awesome. I was not a fan of Fast Forward, but I really enjoyed the series otherwise. The incredible build up in the first few seasons was almost surreal to me. I wouldn't say they "faithfully" recreated them. Haha, I just finished watching "The Golden Puck" too. What a stupid adaptation of an already bizarre filler tale. I'm mostly disappointed they didn't get to wear their "Unmentionables" outfits. I'd like to see some high-end statues or something made of this series, but somehow I doubt that'll ever happen. It's said Fast Forward came when the toys didn't sell as good as producers wanted. Even if it was not connected to the mirage, I think it has many strong points. The voice acting, the animation especially on the fight scenes, the story arcs and character development, the background music which I think is underrated, really good characters like leonardo and Bishop and lastly, the sheer number of great episodes it produced especially from seasons 1-5. As much as I love both the OT and the Nick show, i feel that the 2k3 show, even though it was a hit, never became as popular as the former two, especially the OT. It deserved alot more love. 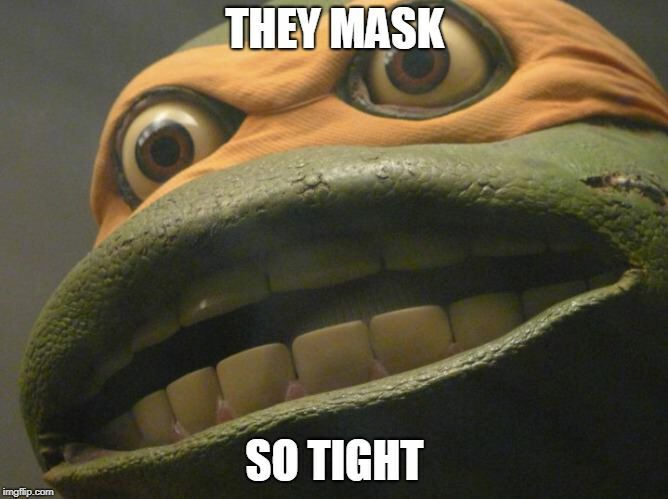 Maybe when the Nick show ends and the maybe general interest in tmnt will shift away from FW and towards mirage, then the 2k3 series will get more praise and be noticed more as the show that was the closest to the original comics and brought tmnt back to life after turtle mania ended. Last edited by FredWolfLeonardo; 06-18-2016 at 12:20 AM. As much as I love both the OT and the Nick show, i feel that the 2k3 show, even though it was a hit, never became as popular as the former two, especially the OT. Sure nothing bate the 1987 cartoon when it came to commercial success and popularity. But I don't know which of 2003 or 2012 became the most popular. We can't really tell until... well, the 2012 series is in the same position as the 2003 series. When people day the 2003 series is "forgotten", I think it has more to do with how another TMNT cartoon popped up 3 years after it concluded and is still going on, of course people are going to talk more about the one that's still on. I suspect that when the next TMNT cartoon is two years in or so, the 2012 series will also be "forgotten". Maybe it's possible to compare saleswise (toys, videogames and other merchandise). If you regard the fact of different currency values in 2003 and 2012 because of inflation. Maybe 2012 has already outsold 2003? I don't know if DVD (including legal download) shall coult since it's easier to get that over the Internet now. Maybe it's possible to compare saleswise (toys, videogames and other merchandise). I think the Nick cartoon just has a larger viewership than the 4Kids series did, which could obviously account for differences in merchandise sales. It seems Nickelodeon is working harder at marketing the turtles than Foxbox-4 Kids TV. What's tough is that the 4Kids series aired on an over the air television station that people could watch for free. Whereas Nick's series airs on Nickelodoen, a channel that not everyone has access to. But it certainly seems like both series have been successful. It's hard to tell though which one has been more successful in their first four seasons. But it's easier to watch it over the Youbue now (even if that doesn't count in the statistics). Nah, Viacom has been policing 4Kids videos harder than usual on YouTube. I'm talking of the Nickelodeon cartoon comparted to the 2003 one. Considering this is what got me into the franchise in the first place. As someone who used to watch the Fox Box like all the damn time in the last decade and 4kidsTV when it was renamed as such. Yes the show is really underappreciated. Heck the show never got an honorable mentioned in the TMNT documentary (Although they did get one of the people involved in it's production for the documentary). What get's me is that this show which had alot going for it, but for some reason it's not as fondly remembered aside from the fans. It had Character development, overarching plot lines, incredible fighting scenes etc. Sure it wasn't perfect, but to me it was an incredible show, and the best TMNT cartoon out there. It lasted over 100 episodes which is a rarity for most cartoons back and today. If the show wasn't so successful it wouldn't have gotten so far. However, I'm glad they included Hun and Bishop into the 2012 cartoon. At least they threw us 2003 fans a bone when they been catering to older fans of the 87 cartoon. Why not, when it symbolizes the second generation of major TMNT fandom.